Set against the decor, modeling retains an almost mineral stiffness. In Portrait of Victor Chocquet a play of lines encloses the hieratic silhouette of the collector, friend of both Renoir and Paul Cezanne. The composition is based on horizontals and verticals, the few diagonals, reduced to a minimum (the legs, the arms of the chair, the hands), being sufficient to avoid monotony. A skillful color accent in the carpet in the foreground is repeated in the pattern of pear-shaped spots in the background. Several axes of various depths converge in a single point, Chocquet's left hand. 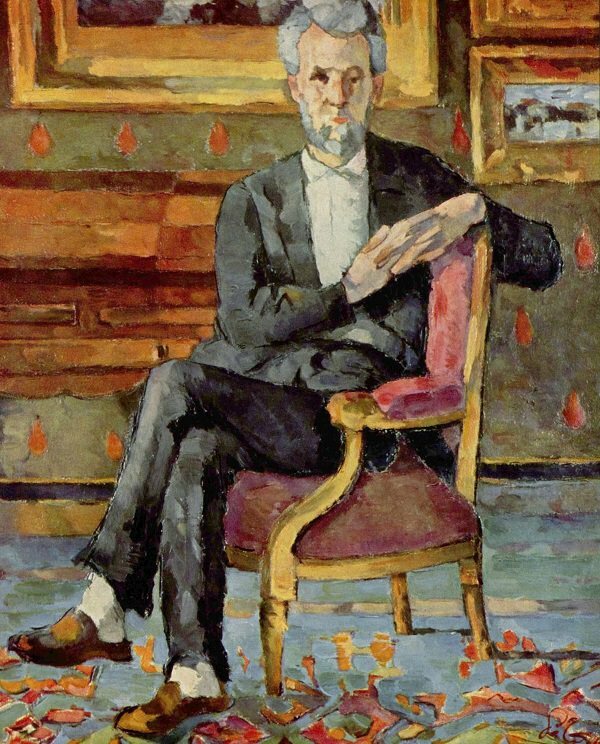 Utterly faithful to sensation, even at the expense of likeness, Cezanne does not paint at equal height the two fragments of black horizontals, right and left of the armchair, which mark the edge of the floor. "I see the planes overlap," he was to say, "and the lines often seem to fall." Victor Chocquet, a simple employee at the Ministry of Finance, was one of the great collectors of the nineteenth century. He began to spend his savings to buy several works by Delacroix. In 1875 he asked Renoir, then still unknown, to paint a portrait of his wife. He bought two Cezannes at Pere Tanguy's exclaiming, "These will look very well between a Delacroix and a Courbet!" The two men became friends and confessed a common admiration for Delacroix who, as Cezanne stated, "served as intermediary between us."